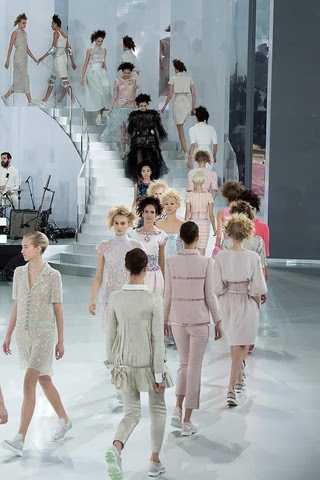 Gala LaVender: Fashion Week Haute Couture Paris - Chanel & Ulyana Sergeenko. Fashion Week Haute Couture Paris - Chanel & Ulyana Sergeenko. Es que Karl Lagerfeld TODO lo hace bien. El faaaabuloso diseñador sigue convencido que la moda de alta costura tiene que ser exclusivamente para la mujer joven, audaz y de grandes billeteras, creando la gran controversia para los fashionistas ortodoxos si éstas piezas son para mujeres veteranas en el fashion world. Con Tilda Swinton, Anna Wintour y su mejor amiga, Grace Coddington en la primera fila -of course-, desde el inicio quedó claro: un tema muy sport, sin olvidar las clásicas little jackets y a la hermosa Cara Delevigne . Los tacones pasaron a segundo plano (para varios diseñadores) ¡OH-OH! El diseñador de 80 años hizo lo inimaginable, hacer que las chicas bajaran "brincando" las escaleras. Siendo el favorito de la industria, no es de sorprenderse que el hombre ya tenga 49 años en Fendi y 31 en Chanel. Repito: todo lo haces bien, Karl. You can't go wrong with Karl Lagerfeld. The fab designer keeps his foot down: haute couture has to be exclusively for the young and audacious women with big wallets, despite the controversy it creates on orthodox fashionistas who claim that Chanel should be a perogative for wealthy seasoned ladies. With Tilda Swinton, Anna Wintour, and his best friend, Grace Coddington's pressence at the front row, the message was prettey clear from the beggining: the collection was inspired by the world of sport, with, of course, those classic little jackets and the gorgeous face of Cara Delevigne; although, high heels, were off the table (for most designers). OH-OH! The 80-year-old designer made the impossible, the girls literally skiped down the staircase. Well, that's new. Being the absolute favorite in the industry, there is no wonder why he's been on the head of Fendi for 49 years and 31 for Chanel. I repeat: you can't go wrong with Karl. No tengo mucho que decir de la colección de la novata Ulyana Sergeenko. Las prendas hablan por sí solas. Son de esas cosas que ves una vez en la vida y nunca se te olvidan. Bellísimo. I've got not much to say about the newbie Ulyana Sergeenko. Those gowns speak for themselves. It's one of those thing that you need to see once, and it lasts an eternity. Gorgeous designs.